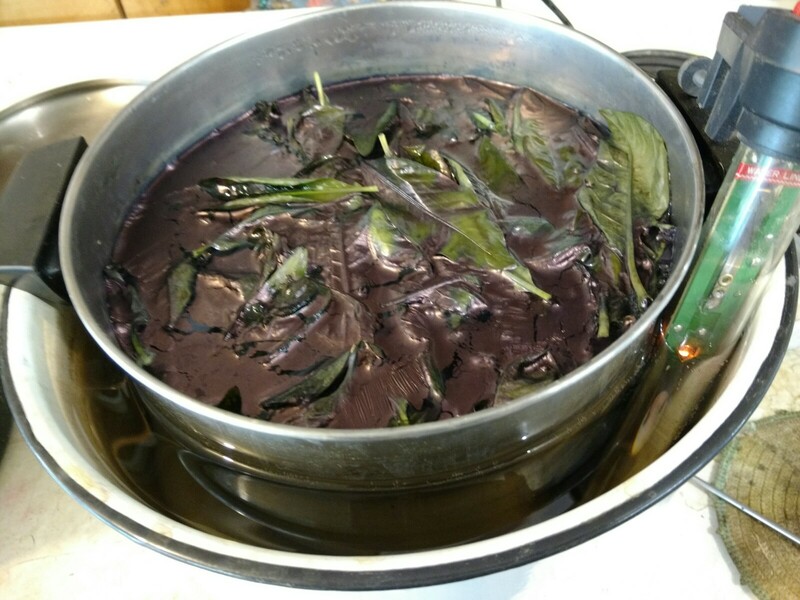 My latest attempt at an organic vat from fresh-leaf homegrown Japanese indigo has me singing the blues — the pale, grayish, stinky blues. 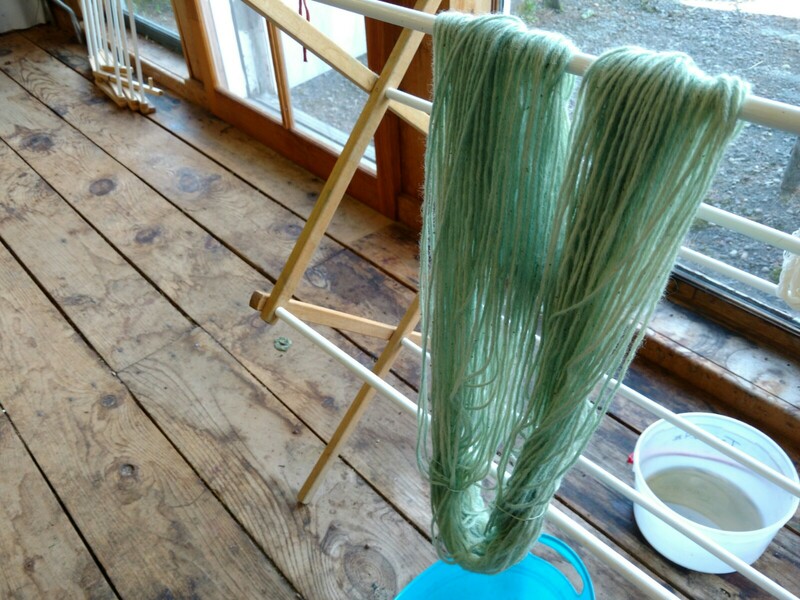 And while this batch of yarn counts as a dye fail, I learned some things getting here. The yarns look better than they really are, but there’s no point letting them dry out for a photo. I’ll keep changing the water until the odor is gone, then overdye them. Probably in a fresh-leaf vat reduced with Thiox. Because it’s the end of August, which in northern Wisconsin means our growing season could end in six weeks or six days. With my fresh-leaf window closing, I have to move on and get some dyeing done while I can. 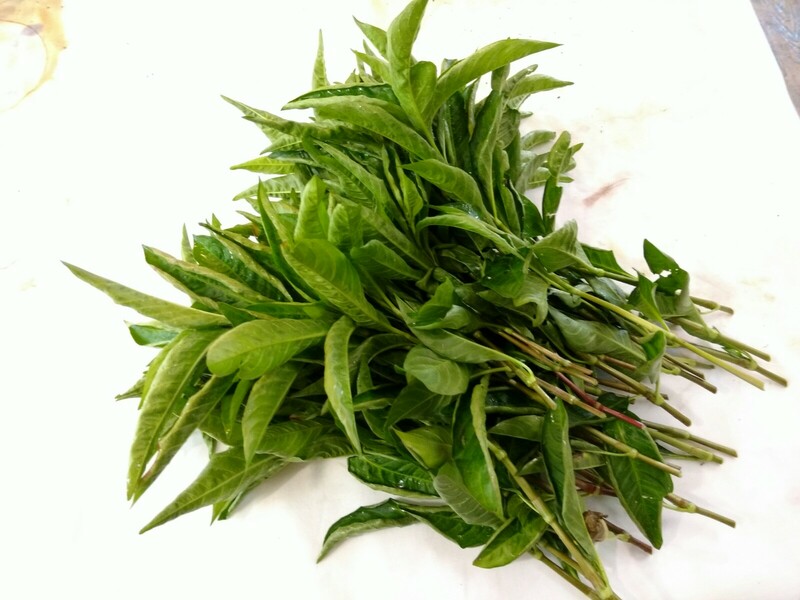 Next summer I’ll come back to fresh-leaf organic vat experiments. In the meantime, here are some things I learned. For this vat, I tried a slow extraction. Instead of heating the leaves to 160F over 2 hours, I left them 24 hours at about 100F, using an aquarium heater to maintain the temperature in the double boiler. It sure looked like that extracted more color from the fresh leaves. 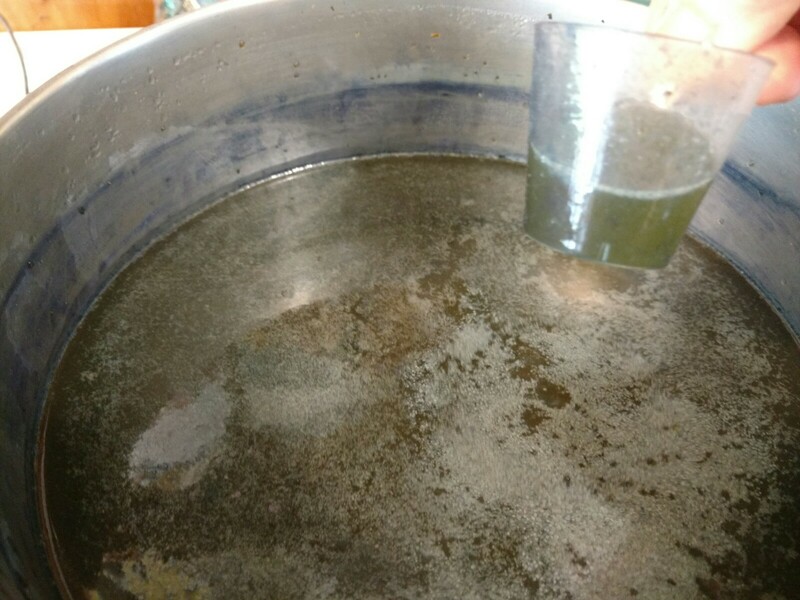 I think it also released much more plant acid into the liquid. After getting the last fresh-leaf vat experiment so alkaline (and because I wanted to dye wool in this vat), I adjusted the pH a little at a time. 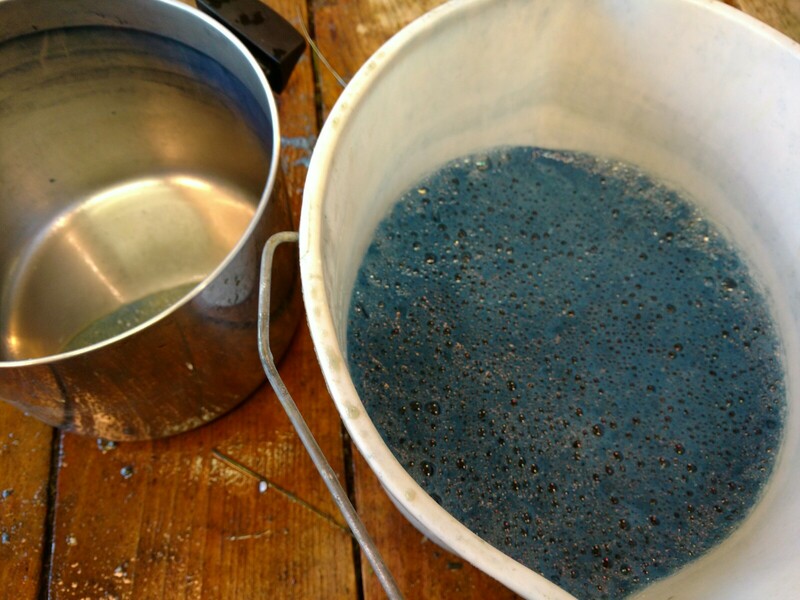 I aerate by into pouring the liquid from pot to bucket, and usually the foam stops turning blue in about 10 minutes. This time in took 3 times as much baking soda to make the liquid alkaline enough and a full hour of pouring, and there was still some blue to the foam. 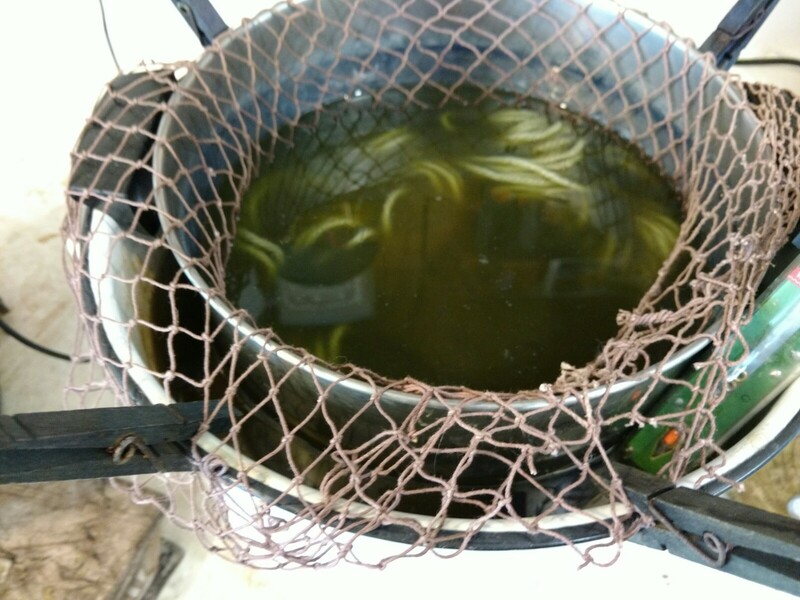 To reduce the vat, I fed it wheat bran and kept it warm with the aquarium heater while it worked. Yesterday when I walked into my studio it didn’t smell at all like sweetgrass and willow. It stunk, but the color of the vat looked right to my inexperienced eyes so I figured it was worth it. I rigged a net to keep my yarn above the bran sludge at the bottom of the pot. I gave two skeins two dips, and could tell the color wasn’t good. So I heated the vat to 140F and gave a third skein two dips, figuring I had nothing to lose. So now I have three skeins that have been rinsed, sour-soaked, washed, rinsed, and soaked in several changed of water — and they still smell faintly like sauerkraut. I’m off to change the water again. Or maybe I’ll just wait and use this yarn in the Sig vat, if it ever reduces!